TierraCast Quick Kits: Mantra Bracelet. Peace. Characteristics: This bracelet kit is the perfect DIY project for beginners to learn how to make jewelry without having to invest in lots of supplies. Additional Information: This kit includes 1 Sunset Dumorite Gemstone Bead. 1 Grooved Bead. 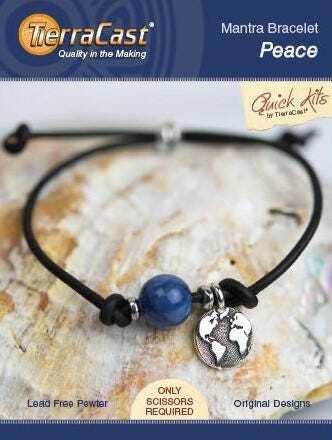 1 Earth Charm. 2 Nugget Spacers. 20" 2mm Leather Cord, Black. Instruction Booklet. NOT INCLUDED: Required Tools: Scissors. Optional Tools: Awl or Sharp Nose Tweezers and Jewelry Adhesive. Yummy Treasures is an authorized dealer of genuine TierraCast products. Don't settle for cheap imitations! Warning: Kit contains small parts. Not intended for children under the age of 12.